Syrian Democratic Forces (SDF) fighters ride atop of military vehicles as they celebrate victory in Raqqa, Syria, October 17, 2017. RAQQA, Syria/BEIRUT - Kurdish groups who led the fight against Islamic State in its former capital Raqqa must navigate a complex peace to avoid ethnic tension with the city’s Arab majority and to secure critical U.S. aid. The Kurdish-dominated Syrian Democratic Forces (SDF) which finally vanquished Islamic State in Raqqa on Tuesday face a big task rebuilding a city left in ruins by months of intense fighting and heavy air strikes by the U.S.-led coalition. The political challenge is no less daunting in a city that falls outside the Kurdish-dominated regions of northern Syria. Its self-declared “caliphate” is also crumbling fast in eastern Syria, helping President Bashar al-Assad and his Iranian and Russian allies to recapture swathes of territory. Keenly aware of Raqqa’s ethnic and tribal sensitivities, the SDF has been working hard to put Arabs at the heart of plans for local government and policing post-Islamic State, analysts say. In the short term, the Raqqa Civil Council (RCC) set up under SDF auspices must urgently provide security, repair infrastructure and supply aid to win the backing of a population exhausted by conflict, and to allow the people of Raqqa to return home. 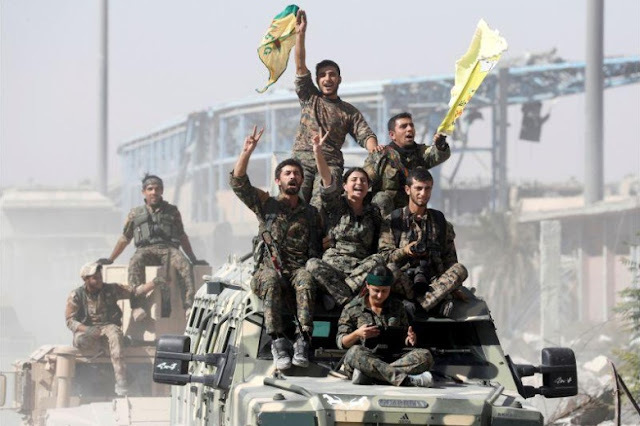 Longer term, Raqqa’s political destiny is tied to the wider fate of the war that has shattered Syria into a patchwork of areas over the last six years, including swathes of the north controlled by the Kurdish YPG militia that leads the SDF. Ultimately, the Syrian state wants to recover control of this city on the Euphrates River, meaning it may eventually become the arena of a new conflict with Damascus, or a bargaining chip in eventual negotiations over possible Kurdish autonomy. “Whoever leads us, Kurd or Arab, we want them to provide us with services,” said a man from Raqqa, speaking outside the RCC headquarters in Ain Issa, north of the city. “Safety and security is the most important thing,” said the man, a government employee before the war who cited lingering fear of the Syrian state as his reason for staying anonymous. Raqqa was not a target for the YPG earlier in the war but gradually became one as the militia emerged as the main Syrian partner for the U.S.-led coalition. The U.S.-led coalition says Arab fighters battling under the SDF banner made up the bulk of the force in the Raqqa campaign. But Kurdish commanders and fighters of the well-organized YPG appeared the leading force throughout the four-month campaign. Syria’s main Kurdish party, the PYD, and its allies may hope Raqqa will eventually join a new “federal” system of autonomous regions they are establishing in the north. But Kurdish leaders say it is too early to discuss that for now, underlining local and international sensitivities surrounding the political project opposed by their U.S. allies and neighboring Turkey. While Syrian Kurds say they want to remain part of Syria, regional concern over Kurdish separatism has deepened since Iraqi Kurds voted for independence, triggering military action by Iraq and tough measures by Turkey and Iran. Turkey, in particular, views rising Syrian Kurdish power at its border as a threat to its security, and unsuccessfully pressed Washington to abandon its alliance with the YPG in the run up to the Raqqa attack. Turkey plays host to a rival Raqqa civil council which regards the YPG as a foreign occupation force. Kurdish politicians say Raqqa’s future is now entirely in the hands of its people. “So far we have not seen any reactions to indicate there will not be acceptance of the SDF, or the RCC,” said Fawza Youssef, a senior Kurdish politician, in an interview. Some YPG fighters quickly began pulling back from the city on Tuesday, handing their positions to non-Kurdish elements of the SDF, a witness and field commanders said. The SDF applied a similar model in the northern Syrian city of Manbij last year after capturing it from Islamic State. “The (RCC) is still closely linked with YPG/PYD power structures, but they have put more time and effort into emphasizing inclusivity than we have seen in some other areas,” senior International Crisis Group analyst Noah Bonsey said. But the risk of unrest would rise if Kurdish groups were perceived to be micro-managing the city. Yasser al-Sayyed, a 43-year-old former car salesman from Raqqa, said people are “happy with the SDF now, of course, because they’re free from Daesh (Islamic State)”. “But this needs to be followed up” with aid, reconstruction and jobs. The United States has deployed a team of diplomats to Syria to work on humanitarian and stabilization efforts. “This is to make sure that after ISIS is cleared, we have conditions in place for people to return to their homes,” Brett McGurk, the U.S. envoy to the anti-IS coalition said last month. But analysts question how long U.S. support will last. A U.S. official involved in post-Raqqa planning said support could not be channeled to a “PYD political project of expansion into this part of the country”, and the United States would not support “the PYD project to make an autonomous administration”. For example, the official said schools could only get aid if they were teaching a variant of the Syrian state curriculum, rather than an entirely new one. “We’re not going to support a separatist entity ... that’s cut and dry,” the official said. Though McGurk said nobody living in SDF-held areas wanted a return of Syrian state control, Damascus may be planning to reassert its influence. A Syrian government official forecast trouble ahead for the SDF in Raqqa and other Arab majority areas of Syria. Kurdish groups who led the fight against Islamic State in its former capital Raqqa must navigate a complex peace to avoid ethnic tension with the city’s Arab majority and to secure critical U.S. aid.